Joyce Carol Oates is a recipient of the National Medal of Humanities, the National Book Critics Circle Ivan Sandrof Lifetime Achievement Award, the National Book Award, and the PEN/Malamud Award for Excellence in Short Fiction, and has been several times nominated for the Pulitzer Prize. She has written some of the most enduring fiction of our time, including the national bestsellers We Were the Mulvaneys, Blonde, which was nominated for the National Book Award, and the New York Times bestseller The Falls, which won the 2005 Prix Femina. Her most recent novel is A Book of American Martyrs (2017). She is the Roger S. Berlind Distinguished Professor of the Humanities at Princeton University and has been a member of the American Academy of Arts and Letters since 1978. 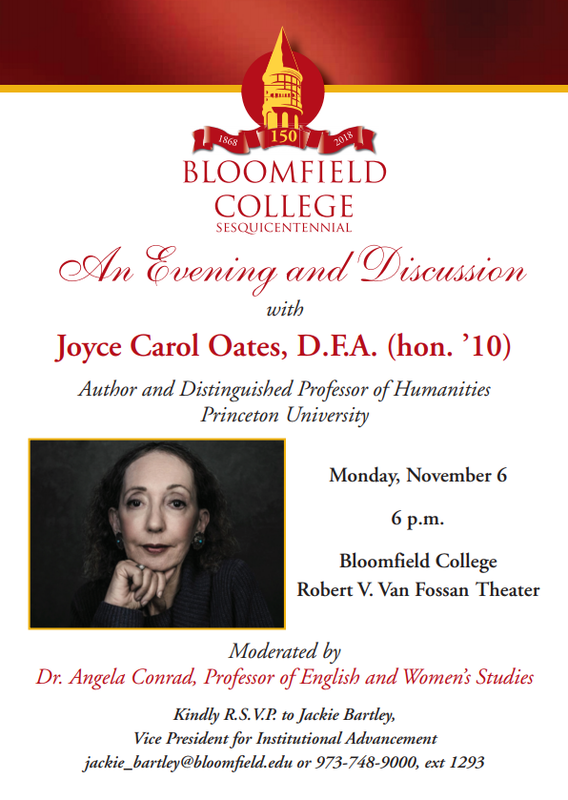 Dr. Angela Conrad, Professor of English and Women's Studies at the College, will act as program moderator during this intimate discussion with Oates, an honorary degree recipient and dear friend of Bloomfield College. All are welcome to attend this free event. To register, kindly respond to Jackie Bartley, Vice President for Institutional Advancement, at jackie_bartley@bloomfield.edu or at 973-748-9000 ext. 1293. The Bloomfield College community looks forward to this very special event. A comprehensive, liberal arts institution located in Bloomfield, New Jersey serving 2,000 students with inspiring stories. Bloomfield College offers 60 academic programs, Division II athletics, and co-curricular clubs and organizations. The College is committed to enabling students, particularly those who have been historically excluded from higher education, to realize their intellectual and personal goals. More than half of the student body identify themselves as first-generation and are the first in their families to enroll in college. The College was ranked No. 1 in NJ and No. 20 nationally in promoting the social and economic mobility of its low-income students to high economic achievement, including top economic quintiles. U.S. News & World Report ranked Bloomfield College the 14th most diverse National Liberal Arts College in the United States.